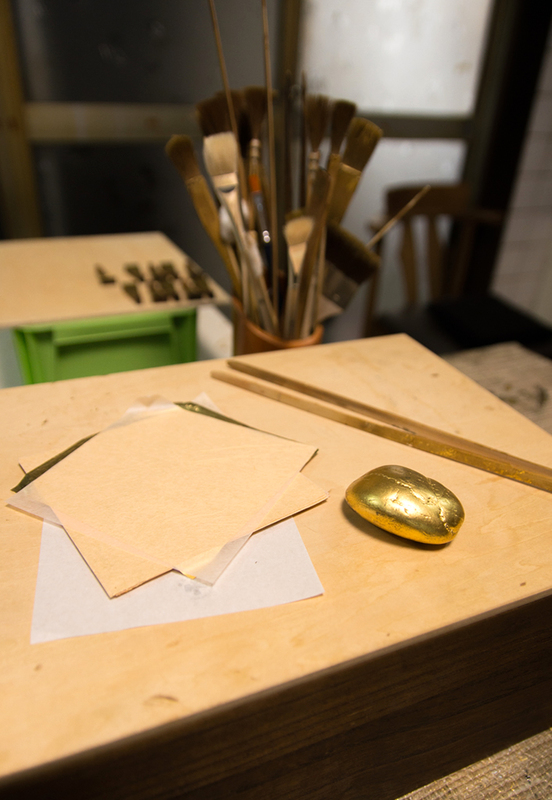 I was able to have a one-on-one lesson with Mr. Fujisawa in which he taught me, step-by-step, how to apply gold leaf to a small object. The artisan was very patient in showing me how to do everything, and encouraged a very hands-on approach. He not only explained the how, but also about his own past experience in his work. Make sure that you bring someone who can speak Japanese with you, and don’t be afraid to get your hands dirty. Mr. Fujisawa does not use real lacquer in the lesson so you are unlikely to be hurt, but if you have a nut allergy be warned that what he uses in place of it is made with a base of cashew nuts. This was a very enjoyable experience and I would happily do it again. I was lucky to indulge in a Gold Leaf Stamping Workshop. From stellar communication via Aki and Takeno, to being taught the intricacies of gold leaf stamping by a master and leader in the field, this made for a truly unforgettable day. I highly recommend this workshop, which I found to be relaxing, informative and fun.